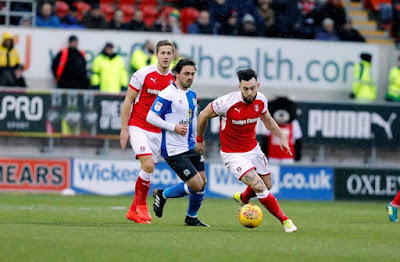 Rotherham United managed to reduce its losses in its most recent financial accounts which relate to the season in which the club was relegated from The Championship. A season in which the team lost 33 times on the pitch. Having switched its reporting year to tie in with the football season, the borough's football league club has posted its results for the year ending June 2017. It shows that income levels were maintained at £13m, only slightly down on the £13.3m reported in the previous year. A loss before tax of £1.24m was recorded, an improvement from the £1.48m reported in 2016. The financial performance is linked to the on pitch performance of the team and the reported loss is mainly due to high wage levels and administration expenses. Wages rose from £4.8m in 2014 to £9.4m in 2016 during the time in The Championship and were recorded at £8.6m for 2017. Staff numbers at the club increased during the year from 130 to 161, mainly in sales, matchday and ground staff. Despite the Football League's Financial Fair Play (FFP) regulations, many clubs in the division take risks in the hope of reaching the Premier League and the financial benefits that come with it. However, at Rotherham United, the wage bill sits well within its income, which is mainly made up of sponsorship, matchday income and central distributions via the Football League. Average league attendance slipped below 10,000 as the team struggled to get results but the number of season tickets remained above 6,000. Income from matches and tickets was slightly down on the previous year to £2.26m from £2.46m. For previous seasons, Rotherham United will have received between £2m and £3m in "solidarity payments" from the Premier League but this has jumped following the negotiation of the biggest ever TV deal for the Premier League. Total central distributions at Rotherham United went from £4.86m in 2016 to £6.96m in 2017. Solidarity payments are likely to have dropped significantly now that the club plays in League One but it is also likely that wages and expenses will be lower. The latest accounts show that commercial income dropped from £4.94m in 2016 to £2.92m in 2017. This is largely due to the way in which the chairman's firm backs the club. ASD Lighting put in around £1m to the club in the year in the form of sponsorship. Chairman Tony Stewart, is the successful local businessman and owner of Rotherham lighting manufacturers, ASD Lighting. He saved the Millers in 2008 when he brought the then League Two club out of administration via a Creditors Voluntary Agreement. ASD put in £2.9m in sponsorship in 2016 and has also extended a loan to the club of £3.8m. The Barbot Hall firm recently reported on its own finances which showed an impressive increase in sales and profits. Turnover increased 20% on the previous year to £26.2m due to increased sales in the company's street lighting products. Profits after tax were at £3.69m. Accounts for the period are not yet available for R U Estates Ltd, the company created to develop and operate the club's £20m New York Stadium, and ASD Lighting Holdings, the holding company for Rotherham United Football Club (RUFC) Limited and ASD Lighting PLC.